Cory Huff, creator of the brilliant business of art blog The Abundant Artist, is dedicated to dispelling the starving artist myth. Through webinars, podcasts, blog posts and coaching, Cory provides guidance on topics such as art marketing, social media strategies, and much more. He also has extensive experience helping artists sell their work directly to their supporters. 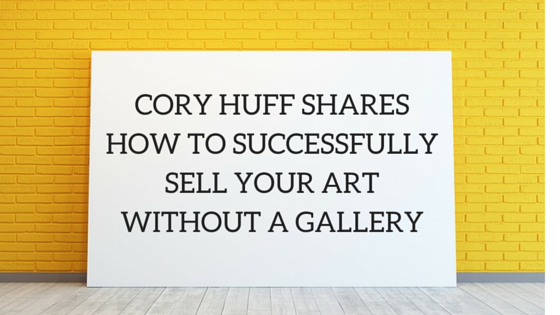 We asked Cory to share his expertise on how you can successfully sell your art without a gallery. Most artists’ websites don’t do a good job of showing their portfolio. Many have a clunky interface and are overdesigned. You need a simple website with a simple background. It’s helpful to have a nice big display of your best pieces on the homepage. I also recommend having a call to action on the homepage. Some ideas are inviting the visitor to your next show, directing them to your portfolio, or having them sign up for your email list. Make sure to have high quality, large images of your artwork on your website so people can see what they’re looking at. Too many artists have tiny images on their online portfolio. This is especially hard to see on mobile devices. Take a look at my Artist Website Checklist for additional information. Artwork Archive Note: You can easily add a link to your website in your Artwork Archive Public Profile Page for additional exposure. You need to make sure your contacts are organized into some sort of usable system. Last year I worked with an experienced artist with 20 plus years in the business - she was selling art in galleries and out of her studio. She wanted to market her art online, but some of her contacts were in her planner, others in her email, etc. It took us a week to organize all the contacts by name, email, phone number, and address. Organize your contacts into a contact management platform. I recommend using something like Artwork Archive to keep all your contacts in one place. Artwork Archive lets you tie in information like which pieces that contact has purchased. You can also organize your contacts into groups such as art fair contacts and gallery contacts. Having something like that is really valuable. This means going out to find customers who will buy from you directly. You can find collectors by selling online, at art fairs, and at farmers market. Focus on showing your work to as many people as possible. And follow up, and continue to follow up, with people who show interest in your work. Add them to your mailing list in your contact management system. Work with art dealers and interior designers to sell your work. Many of these people work to find art for hotels, hospitals, and corporate collections. My friend Matt Richards of Ekko Mobile has pursued this route. A large majority of his business comes from interior designers and architecture firms. Anytime there is a new construction, interior designers look for several pieces of art to fill it. An art dealer will look through their portfolio of artists and look for art that fits the space. Create a network of agents that sell for you. The most critical element of selling your work outside the gallery system is the belief that you can. Believe that people want your art and will pay money for it. Many artists get beaten down by their family, spouse, or college professors who tell them they can’t make a living as an artist. This is absolutely untrue. I know many artists who are having successful careers and I know there are lots of successful artists out there that I haven’t met. The problem with the art community is that artists are relatively solitary and prefer sitting in their studio. Building a business isn’t easy. But, like any other business venture, there are ways to succeed that you can mimic and learn. You just have to get out and start learning how to do it. It’s more than possible to make a living creating art and selling it to enthusiastic people. It takes a lot of hard work and professionalism, but it’s absolutely possible. Want to Learn More from Cory Huff? Cory Huff has more fantastic tips on the business of art on his blog and in his newsletter. Check out TheAbundantArtist.com, sign up for his newsletter, and follow him on Facebook and Twitter.